Bubble Lodge takes glamping to a whole new level. Here, you’ll find an innovative collection of eco domes scattered around a lake on the oldest and largest tea plantation in Mauritius. Truly unique, these domes are semi-transparent, allowing guests to sleep surrounded by nature, without compromising on luxury. Guests are sure to enjoy gazing at the night sky from the comfort of their dome. Each dome is decorated elegantly in brown and beige, with a comfortable bed, wash basin, toilet and an outdoor shower. Bubble Lodge is perfect for fans of the outdoors, as a range of complimentary activities are on offer, including kayaking, hiking, fishing and use of mountain bikes. Head into the surroundings hills, where the Mauritian landscape is sure to impress, and, if you’re lucky, you may spot Java deer or monkeys. On your return, be sure to try some authentic Mauritian cuisine at the onsite restaurant, Bois Chéri, which treats its guests to a gourmet meal accompanied by panoramic views over the lake and tea plantation. Tea tasting is also available here. Hotel child prices apply to guests aged 3-16 years. Enjoy a Mauritian style gourmet meal with locally sourced green tea, accompanied by panoramic views over the tea plantation and lake. Perfect for those who love the great outdoors, activities include complimentary kayaking, hiking, fishing and use of mountain bikes. Guests can also immerse themselves in the heritage of the area with tea tastings at the Bubble Lodge’s restaurant, Bois Chéri. Bubble Lodge is situated in a little village right by the beautiful Black River Gorges National Park in South West Mauritius. 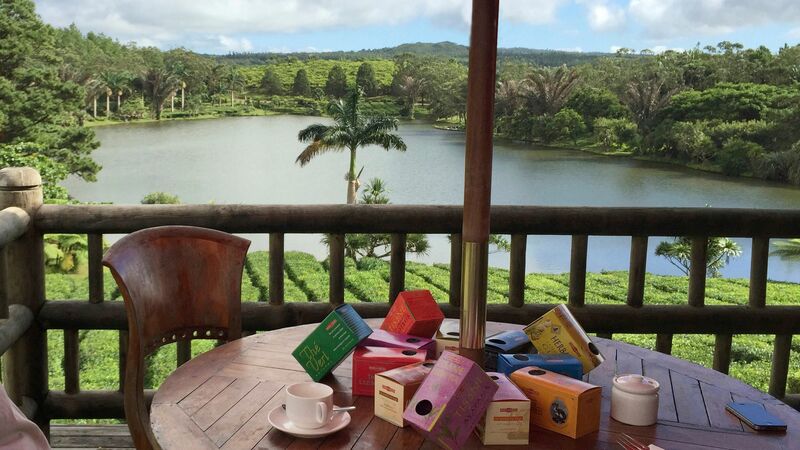 It’s perfect for those who love to be out in nature, as the village is home to the oldest and largest tea plantation in Mauritius, with a stunning lake and magnificent scenery. The National Park comprises of a vast expanse of dense forest, with exceptional hiking trails and wildlife spotting opportunities. Head into the National Park by foot or mountain bike, and, if you’re lucky, you’ll spot Java deer, macaque monkeys, the Mauritian flying fox and lots more exotic wildlife. Bubble Lodge is just a 25 minute drive from Mauritius Airport. Double Bedroom Suites consist of two connected air conditioned bubbles, one transparent featuring a queen size four poster bed, bean bags, coffee table and tea & coffee making facilities. Second, fully opaque bubble houses a bathroom with toilet and sink. A sky-view shower with running hot water is located on a wooden deck outside. Family Suites consist of three connected bubbles; one transparent for a living room with sofa bed for two children and tea & coffee making facilities, second, semi-transparent bubble with a bedroom for parents with two bean bags and coffee table, and third, fully opaque bubble houses the bathroom with toilet and sink. A sky-view shower with running hot water is located on a wooden deck outside. I booked this placed for one night because it popped up while I was looking for things to do in Mauritius, and it seemed like a special thing to do at the end of our trip. It was a bit pricey but I went for it because it seemed like a unique experience. I have to say that we were not disappointed! The tea estate the bubble is located at is beautiful. There?? ?s a little lake where you can paddle a boat and deer running around all over the estate. While the estate is open for the public in the mornings and afternoons it?? ?s only open for those who stay in one of the bubbles through the evening and night. So it was nice and peaceful in the evening of you want to take a walk around the estate. The bubble lodge itself was pretty amazing. When you lay in bed at night staring straight up at the starts you kind of feel like you?? ?re a part of the nature it?? ?s a nice feeling how it all surrounds you. Also the service we had at the restaurant was really nice. We had a very attentive waiter. Me and my boyfriend definitely enjoyed this experience a lot. It?? ?s definitely very romantic and perfect for couples. I do not recommend it for families with children. It?? ?s more of a couples thing. We really had a great time there! “ You must go Bubble Lodge! You can enjoy peaceful nature in the woods , besides pond. It is too difficult to reserve a room , but living 1 day at Bubble Lodge is priceless experience to you. ??????????????? ??????????????? ????????? ??? ?????? ????????? ????????? ????????? ???????????? ??? ??? ?????? ?????????????????? ?????? ????????? ????????? ???????????? ?????? . ?????? ????????? ???????????? ????????? ???????????? ????????? ????????? ?????? ???????????? ???????????? ??? ??? ??? ??????????? ?